One of the best ways to keep a yard clear of biting mosquitoes is to use a mosquito trap. When set up properly, just one or two of these ingenious devices can kill thousands of mosquitoes and all but wipe out a local population. The style of trap varies by brand, but generally they range from indoor units the size of air purifiers to large units that resemble barbecue grills. Some run on electricity, while others are powered by propane tanks. The homeowner places the mosquito trap in the yard between the source of the mosquitoes and where people gather. For example, if mosquitoes tend to come from a drainage ditch at the back of the yard, the trap would go near the ditch to catch the insects before they reach the patio. Typically, it’s better to place the trap upwind of the mosquitoes and in a shaded spot. Because mosquitoes find their prey by detecting CO2, octenol and other chemical odors, as well as light and heat, most mosquito traps use some combination of artificial smells and lighting displays to lure mosquitoes. 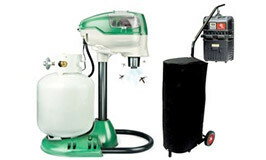 Brands like the Mosquito Magnet and Skeetervac burn propane both to power the trap and to release CO2. Electric machines like the Mega-Catch Ultra mosquito trap rely on odors (Octenol) heat and a lighting array of oscillating frequencies in addition to an optional CO2 system that works off canisters like those used in soda-dispensing machines. Once the mosquitoes get close to the traps, fans capture and force them into catch basins or bags or onto sticky boards to die. Different mosquito species respond in different ways to the attractants, so homeowners need to experiment to find the right combination of stimuli. For example, the Asian tiger mosquito, which can transmit dengue and yellow fever, is a daytime biter and responds better to visual attractants than chemical odors. Most mosquito traps can run continuously, which is important in the beginning as it can take as much as two months to kill enough female mosquitoes to collapse local mosquito populations. The effectiveness of mosquito traps does seem to vary from brand to brand and location to location. In a university test conducted in the salt marsh surrounding a bay in Northwest Florida, a Mega-Catch Ultra mosquito trap caught nearly 3,000 mosquitoes, outperforming several other brands, including the Mosquito Magnet Liberty, the Lentek Mosquito Trap and the Coleman Mosquito Deleto. Ease of use. Probably one of the most significant advantages of electric or battery powered Traps is in their ease of use, especially over traps that rely on propane to produce CO2. Maintenance. Several brands, including the Mosquito Magnet and the recalled Mosquito Deleto have had significant problems with the connections between their propane tanks and their traps, leading to clogged lines, air build-up and other issues that cause the traps to malfunction. Propane vs CO2 Mosquito Traps. CO2 canisters are less expensive to run (one 20-pound canister can last up to fours months), while some propane burning traps can go through one tank a month. The canisters are simple to install and considered safer to use because there is nothing being burned. Read our Mosquito Trap Reviews page.